For many of us who are interested in classic cars we are also interested in classic firearms which normally means we are pretty passionate about the sporting rifles and shotguns of the classic era and the modern sporting rifles and guns that continue that heritage. So, whether its a Holland & Holland Mauser 98, a pre-64 or controlled feed Winchester Model 70, a Purdey self-opening shotgun, or a classic car such as a Talbot-Lago, our interest is instantly piqued. Firearms designer and founder of Sturm, Ruger & Co., Inc. (Ruger Firearms) Bill Ruger was such an enthusiast and that interest carried on in the family to his son William Ruger Jr. 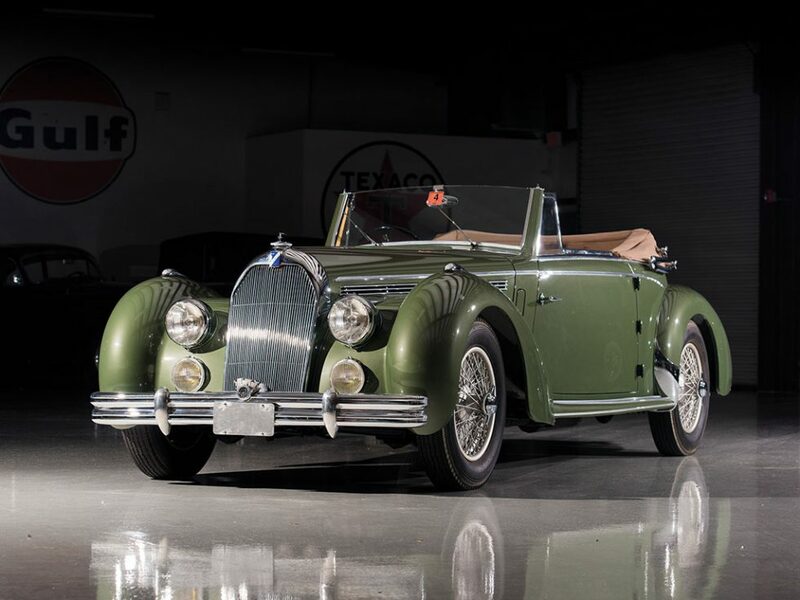 The green Talbot-Lago T26 Record Cabriolet d’Usine in our photos has been a part of the collection of William Ruger Jr. The Talbot-Lago T26 can be found with many body styles in the post war era. 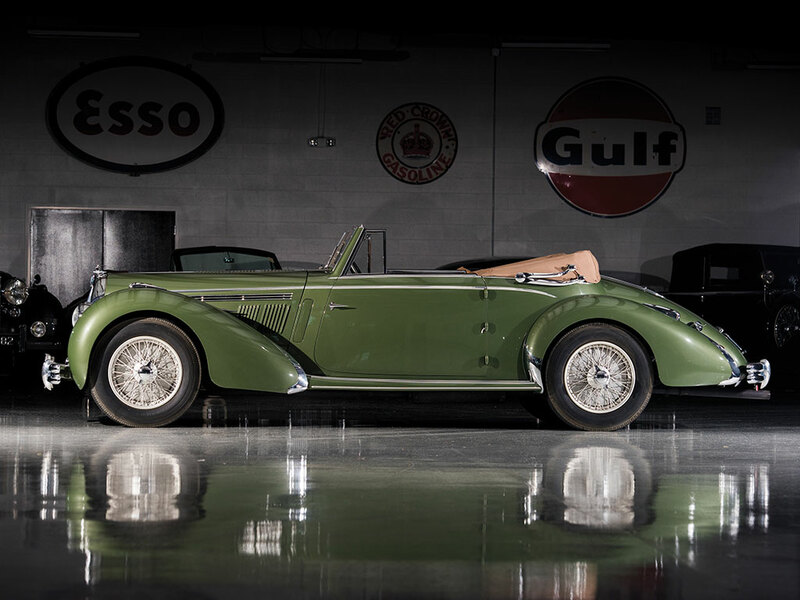 Some are thirties classic such as this 1947 Talbot-Lago T26 Record Cabriolet d’Usine whilst others can be very fifties modern although based on the exact same chassis. Talbot-Lago are one of the less well known sports car makers unless perhaps you are old enough to remember the 1950’s and the motor-sport of the time in which case the Talbot-Lago name will likely be etched in your mind in blood. The Talbot-Lago heritage goes back as far as the late nineteenth century but really begins in the mid 1930’s when the failing Talbot-Darracq was bought by British-Italian businessman Antonio Lago to create Talbot-Lago. In the post war era Talbot-Lago fielded their T26C racing car which proved to be a force to be reckoned with in motor sport. Two Talbot-Lago T26C were privately campaigned in the 1950 24 Hours Le Mans and they crossed the finish line in first and second place. A road going Talbot-Lago Gran Sport Coupe was also privately entered and finished in thirteenth place. The Talbot-Lago even found their way “down under” to the land where kangaroos occasionally try to hop across race tracks during a race, where in 1953 a Talbot-Lago T26C driven by Doug Whitford won the Australian Grand Prix. 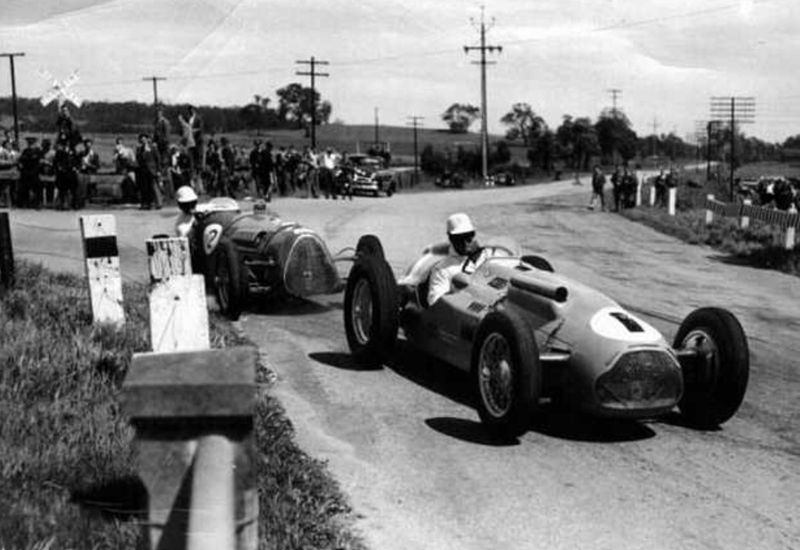 Doug Whitford in his Talbot-Lago T26C here seen racing at Woodside in 1951, two years before he won the Australian Grand Prix. As can be seen the Woodside race track included a rail crossing and may have involved a few kangaroos crossing also. (Picture courtesy primotipo.com). The engine that would power the T26 C racing cars and the same engine in de-tuned form that would power the Talbot-Lago T26 road cars was designed during the years of the Second World War in German occupied France. Tony Lago was joined by engineer Carlo Machetti in 1942 and between them the design work for their post war engine began to take shape even whilst across the English Channel William Lyons and his team were creating the Jaguar XK engine during “fire watch” at their factory during the Blitz. At that time no-one really knew what the future would hold nor could they presume that cars powered by those engines would race against each other at Le Mans in a world set free from the menace of National Socialism. The road going T26 engine was fitted with twin carburettors whilst the racing T26 C had triple carbs. 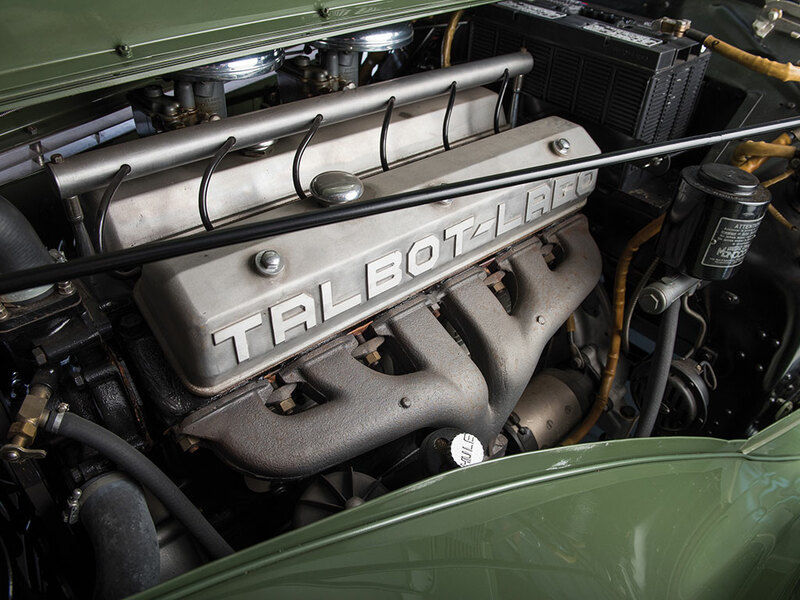 The Talbot-Lago T26 engine created during the war years was an in-line overhead valve twin cam six cylinder of 4,482cc capacity breathing through twin Zenith-Stromberg carburettors and producing 170bhp. The racing version was lightened even to the extent of having hollowed out camshafts and was fitted with triple carburettors to push power up to around 200bhp or so depending on specific engine tuning work. The cylinder head of the T26 engine was of a “hemi” head cross flow design with individual inlet and exhaust ports. 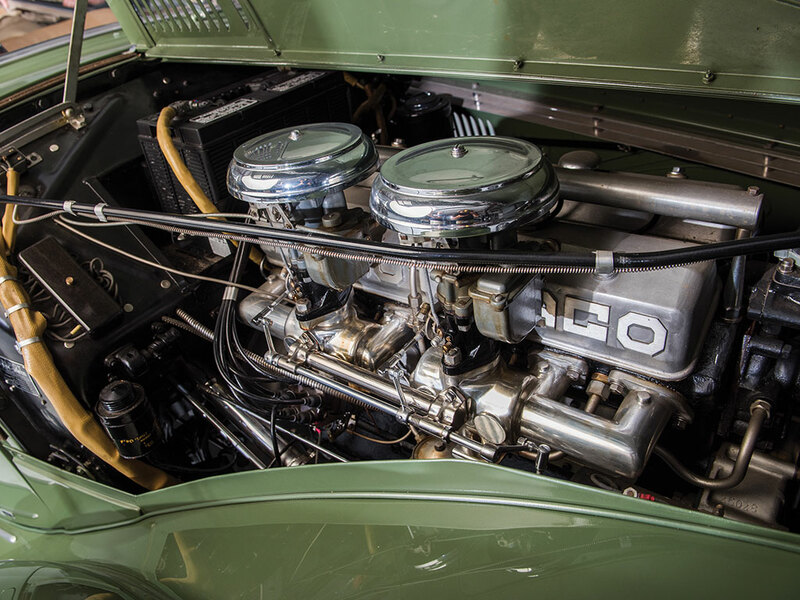 The hemi head of the T26 engine was designed with individual inlet and exhaust ports to avoid hot spots in the head. 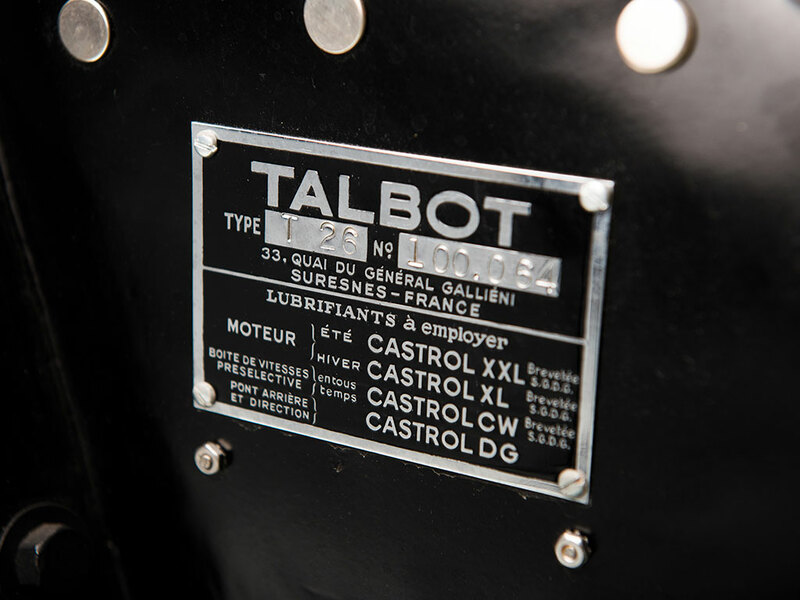 The road going versions of the Talbot-Lago T26 were given the option of either a conventional four speed gearbox or the much easier and quicker to use Wilson pre-selector four speed gearbox. For the racing T26C the Wilson gearbox would have been the universal choice, whilst for the road going T26 either may be found but the Wilson is preferred, it was an additional cost option. Operation of the Wilson transmission is very straightforward. Before a gear is needed the pre-selector lever is moved to select it. When the gear change is wanted the driver simply needs to depress and release the clutch and the pre-selected gear is engaged. No need to double de-clutch. 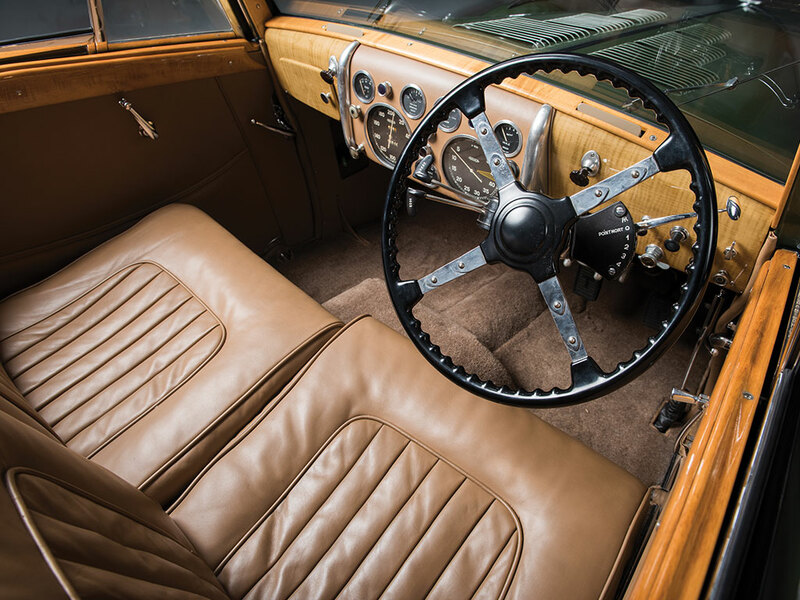 The interior of this 1947 Talbot-Lago T26 Record Cabriolet d’Usine is done in the classic thirties style. The controls for the Wilson pre-selector gearbox can be seen to the right of the steering column. The suspension of the Talbot-Lago T26 features an independent front with coil springs and a live axle rear with leaf springs. Brakes were drums all around and as can be seen in the pictures these were made as large as the wire wheels could accommodate. The T26 is fitted with drum brakes all around and as can be seen in this picture the drums are as large as the wire wheels can accommodate. The road going Talbot-Lago T26 Record was first shown at the Paris Salon of 1946. The car’s 170bhp engine was powerful by post war standards and was capable of driving the T26 Record up to speeds of around 105mph (170 km/hr) depending on the body style fitted. These cars were made in a wide range of body styles including four door saloons and two door coupes such as the green car in our photographs. But the body style options did not stop there. The style could be classic pre-war or made in the new post war styles. To see a previous Revivaler post of a 1954 T26 made in a more modern style click here. The T26 Record Cabriolet d’Usine looks just as pretty with the top up as down. The Talbot-Lago factory continued to produce cars up until about 1958 but was under more and more financial stress. Tony Lago eventually accepted an offer from Simca to buy the company and Talbot-Lago was sold to Simca in 1959. It was the end of an era of some of the most desirable motor cars one could hope to find. Sadly, Tony Lago passed away in 1960. Early post war Talbot-Lago T26 Record convertibles were fitted with the more expensive windscreen without a top border as can be seen on this car. 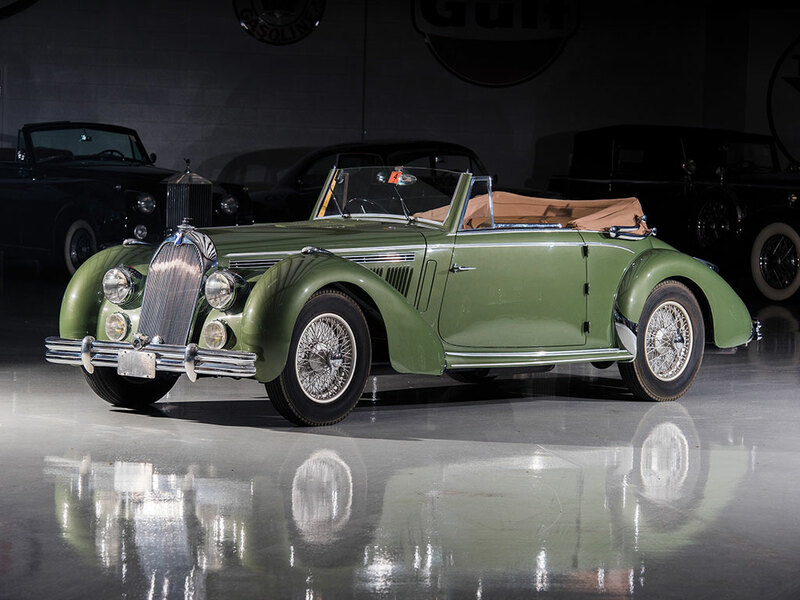 The green 1947 Talbot-Lago T26 Record Cabriolet d’Usine in our pictures was first brought to the United States in the sixties and was purchased by William Ruger Jr. sometime after that. 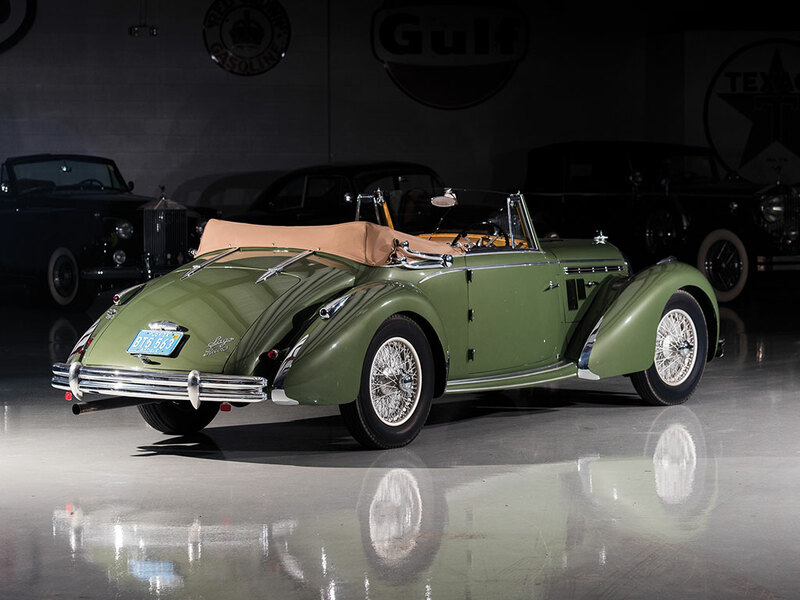 In 2004 William Ruger Jr. commissioned a full and painstaking restoration of the car undertaken by Chris Charlton of Oxford, Maine. The emphasis of the restoration has been to ensure the car is restored into as original a condition as possible. You will note the attention to detail in seeking an authentic restoration in such details as the painted, not chromed, wire wheels. 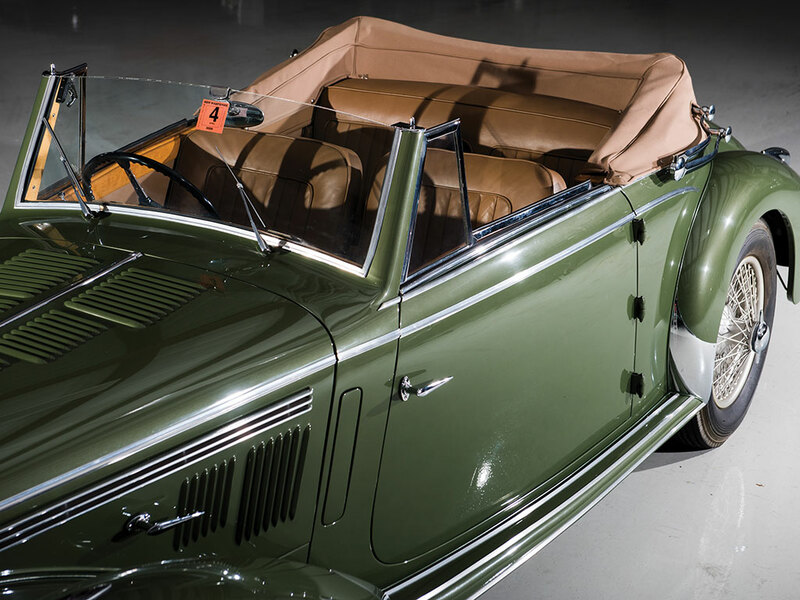 The restoration of this car has been done to bring it into a renewed original condition. This car is coming up for sale by RM Sotheby’s at their Amelia Island auction to be held between 10th-11th March 2017. This is a car made in the classic tradition and it is the automotive equivalent of a fine Holland & Holland double rifle. 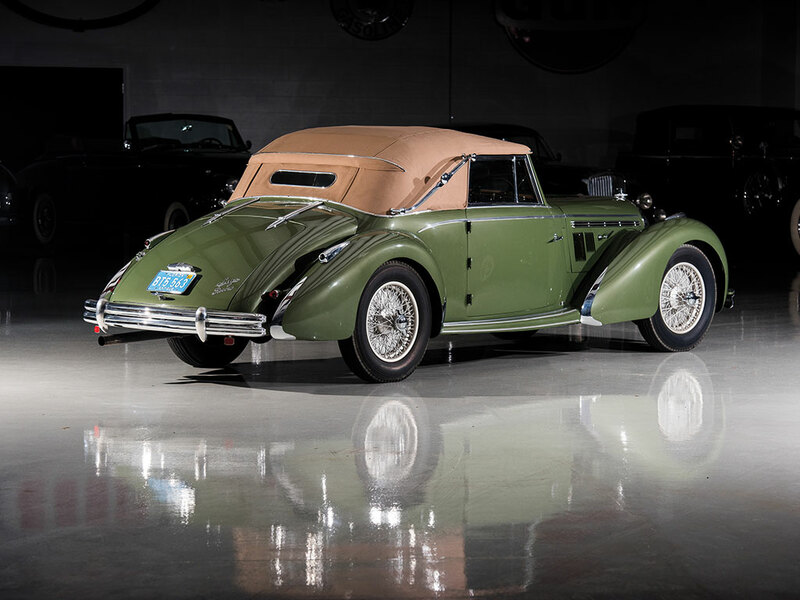 It was part of the collection of a man who is a connoisseur of both fine sporting arms and fine classic cars. Perhaps it will find its way into the collection of a new custodian who shares similar passions. (All pictures courtesy RM Sotheby’s unless otherwise marked).